- NZD surges after surprisingly upbeat RBNZ interest rate statement. - RBNZ still projects hikes in 2021, avoids warning about odds of a cut. - Some question RBNZ, as others say market was too pessimistic. The Kiwi Dollar surged against rivals Wednesday after the Reserve Bank of New Zealand (RBNZ) hinted it is not yet ready to entertain the idea of an interest rate cut, taking markets by surprise barely a week after the Reserve Bank of Australia (RBA) changed its own policy guidance. The RBNZ held its interest rate at a record low of 1.75% for another month this February and said the next move could be either up or down when markets had looked for it to warn that a rate cut was becoming increasingly likely. 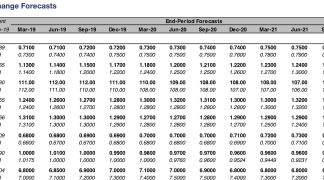 Rather than warning of rate cuts on the horizon, the RBNZ used its long-term projections to signal to markets that rates will remain at their current level for another two years before beginning to rise some time early in 2021. "There are upside and downside risks to this outlook. A more pronounced global downturn could weigh on domestic demand, but inflation could rise faster if firms pass on cost increases to prices to a greater extent," the RBNZ says. Just like the RBA one week ago, New Zealand's central bank said that growth in trading partner nations, like China, is expected to moderate further in 2019 and warned that the risk of an even sharper downturn has risen of late. However, the RBNZ also said Kiwi economic growth should pick up during the year ahead because of the government's plans to increase its budget, low levels of unemployment and due to the bank's supportive interest rate stance. Although growth projections were lower this time around. "We continue to expect an OCR cut by year end as growth disappoints (starting in Q4); we are forecasting November, with two cuts to follow next year," says Sharon Zollner, chief economist at Australia & New Zealand Banking Group. New Zealand's interest rate has already been at a record low for more than two years after weak inflation pressures left the consumer price index below the midpoint of its 1%-to-3% target, bu the outlook has deteriorated lately. Absent declines in the supply of available goods, higher inflation normally requires a pick up in demand. But the global economy has been slowing for a while now and is expected to weaken further during the year ahead. This has seen investors bet heavily that the RBNZ will be forced to cut rates this year, which had dragged the market-implied interest rate down to just 1.54% for November 14, 2019 by Tuesday. But that implied rate rose to 1.64% overnight Wednesday, taking the New Zealand Dollar up with it. "We recently changed our view on the OCR outlook and expect the OCR to remain on hold at 1.75% until February 2021," says Mark Smith, an economist at New Zealand's ASB Bank. "However, both our and the RBNZ’s OCR views are contingent on the economy regaining momentum over 2019. The strength (or otherwise) of the economy this year will be pivotal to whether the RBNZ remains on hold or does indeed cut the OCR." 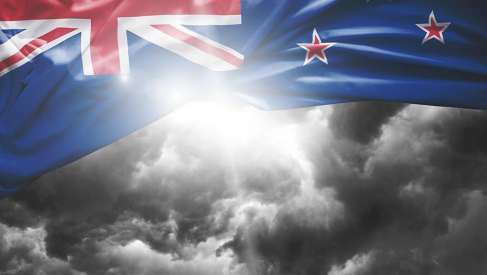 The NZD/USD rate was quoted 1.29% higher at 0.6827 during the London morning Wednesday and is now up 1.7% thus far in 2019,. The Pound-to-New-Zealand-Dollar rate was -1.17% lower at 1.8905 and is now down -0.23% for 2019. The Kiwi rose against all G10 currencies. 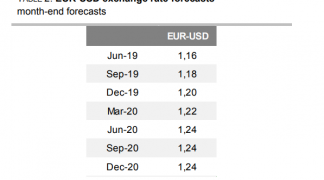 "While this likely sets the scene for further downside pressure on AUD/NZD, we continue to see global headwinds as leaving open a risk of a RBNZ rate cut this year and see scope for further downside pressure on NZD/USD in the coming months," says Jane Foley, a strategist at Rabobank. "The market was positioned for an even more dovish statement," says Kim Mundy, a strategist at Commonwealth Bank of Australia. "We expect NZD to lose some of its current strength, but it is clear there is a lot of support for NZD reflecting the well-performing New Zealand economy, the upgrade to New Zealand’s sovereign outlook by selected international credit rating agencies, the persistently high New Zealand terms of trade, and the continued investor interest in New Zealand assets." Changes in rates are normally only made in response to movements in inflation but impact currencies through the push and pull influence over international capital flows and because of their allure for short-term speculators. The RBNZ said Thursday it will eventually achieve the midpoint of the inflation target once capacity pressures pick up, even though the global economy is turning over and the consumer price index has already been below the midpoint for around five years. "The outlook is weaker overall, with headline inflation now expected to decelerate to 1.2% y/y in Q3 2019 before picking up to 2% by the end of 2020, with no overshoot of the midpoint as previously.," says ANZ's Zollner. Zollner is not alone in her downbeat appraisal of the Kiwi inflation outlook as analysts at Westpac said Wednesday that some of the RBNZ's latest forecasts seem a bit out of data already. They say the economy is slowing faster than the new projections imply and that the forecasts do not take account of recent data detailing changes in net migration to New Zealand. "One reason for the RBNZ’s sanguine view may be because its analysis is a little out of date. The MPS included a forecast of December quarter GDP growth of 0.8%. That cannot possibly incorporate the information in the Quarterly Employment Survey, which was very weak and is an important indicator of GDP," says Dominick Stephens, an economist at Westpac. 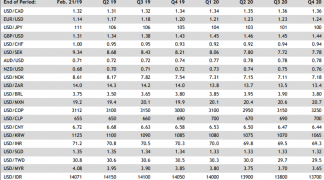 And GDP growth fell to an annualised pace of 2.6% during the third quarter, down from a revised 3.2% for the second quarter, which was the weakest pace of expansion seen in New Zealand for three years. "The RBNZ’s assessment of the New Zealand economy will probably soften once a weak December quarter GDP and lower population growth are incorporated into their thinking. That means the next monetary policy update is already “preloaded” in the direction of a dovish shift," Stephens adds. The RBNZ warned in August 2018 that it would cut interest rates this year if economic growth did not pick up during the six months to the end of December, only since then inflation data has convinced the market that a rate cut is no longer a done-deal, and official data has shown growth slowing even further. Now the Chinese economy is expected to slow even further in 2019 than it already did last year and the outlook for global growth has deteriorated of late, which is a problem for New Zealand because the Kiwi currency is underwritten in large part by a significant goods trade relationship with China. Furthermore, March 01 will see some U.S. tariffs on imports from China more than double to 25% if a deal that ends the trade war between the world's two largest economies is not agreed or the increase deferred before then. "The likelihood of no escalation in US-China trade tensions (see below) and the potential of China stimulus to provide some support for the economy in China will help ease concerns over the global growth outlook," says Fritz Luow, a currency analyst at MUFG. 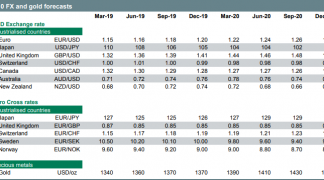 "The scale of the NZD rally today that highlights the possible excessive level of pessimism that currently exists in global rates and FX valuations could well be repeated in other currencies that have under-performed on global growth fears."